If you have started your blog and want to make money, you can join high paying affiliate programs. Affiliate marketing is the best way to make money online. You can start earning more money than the ads and does not require any investment to start. Yes, you heard right, you don’t need to invest a single penny to start making money from high paying affiliate programs. Any blogger and website owners can follow the affiliate techniques to earn money. But, it’s difficult for them to find out the best and high paying affiliate programs. You need to find a product that matches your niche and has an affiliate marketing program. It should be of high quality to promote on your blog and in need of an audience. So, I have decided to provide high paying affiliate programs to every bloggers and website owners to promote and earn handsome money. These are the products that I also promote on my blog and make handsome amount of money. You can join them too and start earning money online. WPEngne is the best-managed hosting provider company. With over 50,000 plus customer around 120 countries WPEngine offers the most popular managed WordPress hosting as compared to any other providers. Many online marketers like Syed Balkhi of WPBeginner using the WPEngine managed hosting to run the most popular blog called WPEngine. WpEngine has a high quality and the fastest managed hosting which can help your website at the time when it starts getting the huge amount of traffic and does not come up with a downtime. What is the best part of WPEngine affiliate product? WPEngine affiliate program is run by the ShareASale affiliate network and offers a high commission rate of $200 for each sale you refer to it. $200 is the 100% commissionn of the first customer payment whichever is a higher amount. In addition to this, they also provide a commission of $50 for each sale for any referral of your sub-affiliates. Earning Commission: $200/sale or 100% of first customer payment(Whichever is higher). Freshbooks is the best accounting software for your business. If you are freelancer or online business owner and want to manage and track all your accounting transactions. Then, Freshbooks is the best choice for you to create and analyze all your financial operations. No matter whether you are an accountant or not. Freshbooks require no expertise of accounting. It comes with man easy to use features a business owner can perform accounting task in minutes. 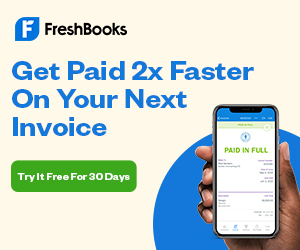 Send automated invoice, get payment with the payment system of Freshbooks. Tack your expenses in the single dashboard and increase your growth without any worry. Sign up for the Freshbooks affiliate program and receive a minimum of $55 per referral! Grammarly is the high-quality online Grammar checker tool that can help you to remove grammatical errors. You can use the free version of Grammarly that provide you limited features. Premium version provides you all the features like plagiarism checker, punctuation checker, and many more corrections. It can help you to write error-free English without any English Grammar knowledge. You can become a writer by using all the free and premium features of Grammarly. If you want to know more about it, You can find out more in Grammarly review but if you want to checkout more about it’s affiliate programs then keep reading this post. What is the best part of Grammarly for affiliate marketers? You can earn for free users signup form you send to Grammarly website. You will receive $0.20 commission when your user’s signup with Grammarly for free. This online Grammar checker tool is for everyone. Means you can promote it to all your users and earn commission for free signup. In addition to this, if the free users upgrade their account to the premium version of Grammarly, you will earn $20 as a commission. It’s a high paying affiliate programs for every bloggers and website owners to promote this type of high-quality product to your users that can change their life as a blogger and writer. If you are intelligent enough, you can earn $25 as a bonus point by just writing a post for Grammarly and placing a banner. Sign up for the Grammarly affiliate program and receive a minimum of $20 per referral! GetResponse is the all-in-one online Marketing solution for all the professional bloggers and website owners. It is a well-known tool for Email Marketing, Marketing Automation, and Landing Page creation. You can call its features at a very affordable and very low price of $15/month only. What are the best features as an affiliate product for bloggers? GetResponse affiliate programs offer 33% commission on each sale you send to their website. In addition to this, you will also get a recurring commission everytime the user renew their account. It offers a 33% lifetime commission and is the well known high paying affiliate programs with the highest recurring payment you can get online.This is the best recurring affiliate program. Sign up for the GetResponse affiliate program and receive a 33% recurring commission for each sale! Aweber is the online Email Marketing Software to create automated emails. You can track your email also with its online features. It is the popular Solution use by 100,000 plus users. What is the best part of Aweber affiliate product for bloggers? Aweber offers their affiliate partners a 30% recurring commission for as long as the users renew their plan for each time. I have seen many bloggers earning handsome money with Aweber affiliate program. Aweber is the high-quality software when you promote to your users, you are actually giving value to your users. Earning Commission: 30% recurring commission for each sale you refer. Sign up for the Aweber affiliate program and earn 30% recurring commission for life. Shareasale is the top affiliate marketplace network where you can find many affiliate product to promote and earn money online. It’s the most trusted network I am using and have no problem in getting any payments. Even many bloggers find this network easy to earn money online. Shareasale provides best support which can resolve all your payment and affiliate related problem at the earliest time. The best part of a Shareasale affiliate program. You will earn $1 for each free signup you refer to the ShareASale. If you refer any advertiser to join its affiliate program and promote the product, you can earn $125 for each referral. Find a sponsor for your website with shareasale as it is the best with high paying affiliate programs with potential to earn more money. Sign up for the Shareasale affiliate program and receive a minimum of $150 per referral! Elegant themes are one of the most popular WordPress themes provide. It’s Divi theme is the best selling theme and most popular online theme well known for its drag and drop features to create beautiful websites for conversions. They provide a very affordable membership plan for their users to get all their high-quality theme and lifetime support. Your audience will love their theme and you will get more trust and value from your valuable readers. What is the best part of Elegant Themes to promote and earn money? Creating a high-quality product and giving 50% recurring commission to bloggers makes this product as the highest paying affiliate programs. It means everytime users renew their product you will get 50% commission. Sign up for the Elegant Themes affiliate program and receive 50% recurring commission for life! HostGator is the top web hosting provider company. With 9 million domains already hosted, Hostgator is the most popular and affordable shared hosting provider company to start a blog. by providing shared hosting, dedicated hosting and WordPress hosting and VPS hosting, Hostgator is the most trusted and reputed hosting provider to promote. What are the Best features of HostGator affiliate program? You can earn $50 for 1-5 sales each month. However, if you are able to provide 21 sales a month, you can earn up to $125 for each sale you refer to HostGator. If you want to know more about it, You can find out more in Hostgator review but if you want to checkout more about it’s high paying affiliate programs then keep reading this post. They provide very affordable hosting to their users and because of this, you can earn more money from its affiliate program. Sign up for the HostGator affiliate program and receive $125 commission/sale! MyThemeShop is the online beautiful WordPress theme provider. These themes are the trusted themes by the bloggers and website owners which are optimized for their speed and SEO. Their beautiful designed and well-optimized themes are the most recommended themes by the well know bloggers like Zac Johnson, Matthew Woodward, and Shoe Makers. They are using its themes and their website earn handsome money every month with the speed and performance of the theme. Mythemeshop offers 70% commission for each sale and subscription you refer to the website. This is the high paying affiliate program for any theme providers. Sign up for the MyThemeShop affiliate program and receive 70% commission for each sale! StudioPress is the best WordPress themes provider online. It offers the Genesis Framework theme, which is the most popular framework for WordPress themes. Many online Affiliate marketers and top bloggers like Neil Patel use Genesis themes developed by StudioPress. Genesis Framework themes are the high-quality WordPress themes fully optimized for SEO and for high performance. In addition to all these, StudioPress has more than 190,000 plus users using premium WordPress themes and plugins. What is the best part of StudioPress to promote and earn money? You can earn 35% of commission for each sale you make for StudioPress. For each referral sales you will about $75 and if you are the best affiliate marketer and able to make 11 sales a month, you can make $150 for each sale too. Sign up for the Studiopress affiliate program and receive $125 commission for each sale! Affiliate Marketing is the best source of earning online. It has high earning potential to make money online. You can earn passive income with few initial efforts. Here are some affiliate programs which offers residual income which you can signup for free right away and start earning commission. Since you are smart enough, you can always go to these websites and read affiliate information with below links. WPEngine: $200 commission for each sale you refer. Vertical Response: $5 for free signup and $100 per sale. Grammarly: $0.20 for free signup and $20/sale commission. Shareasale: $1 for each free signup commission and $150 for each advertiser account. I will keep updating this list which I found more profitable program to join. If you know any other high quality affiliate program with high paying commission potential, do let us know by commenting below.